Most of my gaming group live about an hour away from me, in Podunksville. I finally wrestled the first Saturday of every month away, so one night a month we play at my house. Well, as members of the group acquire more responsibility, we find it harder and harder for us to meet face to face. So we kicked around the idea of distance gaming and I went on the hunt to find some technologies that helps bring the table to the internet. I have tried each of these applications, unless otherwise stated, and have provided as much information as possible to help anyone else out there decide whether they like it or not. RPTools have a suite of five open source, cross-platform (Java 5) applications at your disposal. Honestly, I cannot believe this stuff is free. Even the one app still in development, the CharTool has a very nice level of refinement. They offer the DiceTool, MapTool, TokenTool, InitTool, and CharTools (still in dev) on their site. I definitely urge you to check out RPTools. Its free, works on any machine with Java 5, and if you are code savvy, can be extended by modifying the available source code. ScreenMonkey is from the same people that brings you Fractal Mapper, NBOS. ScreenMonkey requires that the GM be running on a Windows machine, but players can connect with any modern web browser. The full version costs $34.95 USD (and you only need one), but there is also a free Lite edition which comes without scripting, saving, and announcement capabilities. I think the biggest selling points for this software is that you only need one copy, it is easy extendable by editing the HTML page players see as well as supporting the fairly robust VB Script. It has a powerful chat program, chat archives, and extendable minis. It supports initiative, fog-of-war, Fractal Mapper maps, sound (mp3 & wav), dice rolling, and map annotations. I have used this software a lot, myself. 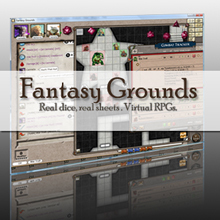 Fantasy Grounds II is a pretty slick looking application, and probably is the most refined app out of the list. It is probably the closest to what DDI wants to be, but it just so happens you can use FGII today. However, Smiteworks wants to charge for both player and GM licenses at $23.95 and $39.95 USD respectively. It has a lot of DirectX, so this is Windows only. FGII supports some nicely animated dice (color customizable) to roll, player handouts, maps, tokens, portraits, drawings, character sheets, and even rule book references. It has a very robust integrated chat client and supports the linking of resources. It has some sweet drawing utilities that even support pressure sensitive drawing tablets. It has character sheets, combat tracker, and player turn seperation in the chat window. If you have the ca$h to spend, this might be the app for you. Smiteworks also makes adventures ready to use with FGII. d20Pro is also very polished, I just wish my 30 day trial hadn’t expired before I really put it through the paces. It is available for $29.95 and everyone will need a copy (each copy can be both DM & player). There is a Windows version as well as a Mac/Linux version. d20Pro has done a pretty good job at incorporating the d20 rule set. You can program attacks for monsters which is based upon their Hit Dice and Strength or Dexterity. Special ability templates and the four OGL spellcasting classes of cleric, druid, sorcerer, and wizard are all supported and extendable. Spell effects are tracked during play and the spells integrate with the special ability templates. Fog-of-war, grids, feats, skills, intiative, and saving throws are all supported. d20Pro has a dice roller, saveable game logs, a main chat and separate player to DM chats. You can even give monsters an inventory. All in all, it is a pretty solid application, if you are playing a d20 game. Battlegrounds is a pretty decent virtual table top that I find very similar to FGII, but it works on both Windows and Mac (sorry Linux users). It has a dice roller, chat window, fog-o-war, zoom, grid snap, and supports .png which means you can have transparencies. It also has nifty token facing and label overlays. Battlegrounds is also coming out with a Wargame edition that will be suited to wargames. Battlegrounds comes in two flavors, GM or Player at $32.00 and $16.00 respectively. Open RPG has been around awhile (remember WebRPG? ), and is the oldest of the open source solutions I am aware of. This application is cross-platform and available for the cheap price of free. It also has a decent sized community supporting it. It has all the basics, map, miniatures, chat and dice. You can zoom, grid, and freehand draw on the map as well. The game tree is the most customizable aspect, allowing users to create custom character sheets and GM aids. 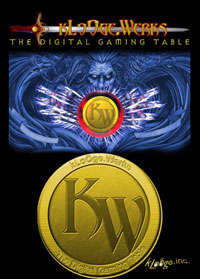 kLoOge Werks is a cross-platform (Java 5) digital gaming table that comes with two different licenses. A GM license costs $30.00 USD and the player license costs $15.00 USD, with bundle discounts. I actually got a demo version of this at the first GenCon in Indy. It is fairly polished and includes a map with masking and fog-o-war, programmable dice, chat, spell shape templates, and a round-to-round event tracker. It supports the big three image types (.jpg, .png, & .gif) as well as threatened areas, character sheet based dice expressions, animated gifs, audio support (.wav, .au, .mp3, .ogg), event based sound, facing, and health gauges. Its pretty full featured, and definitely a contender. The GUI is pretty polished even if their website isn’t. D&D Insider: This is the official platform for playing D&D 4e online and is available for a MMOesque monthly subscription of $14.95 USD, and its only available for Windows users. Most of us are aware that D&D Insider’s online tools are way behind schedule (and therefore over budget as well). After pulling the plug on their social network for gamers (Gleemax), Wizards of the Coast is focusing all their resources on developing what may be the best platform for playing 4th Edition D&D. While it hasn’t even reached beta testing yet, all the video demos of the software are very polished and professional. It gives you access to a Character Visualizer (make digital 3D mini of your d00d! ), Dungeon Builder, Character Generator, Game Table, D&D Compendium (rules), and access to the online magazines Dragon & Dungeon. Though I haven’t used it personally (who has? ), from what I have seen, the Game Table interprets the rules for you, making movement/action available based upon your character (ex: highlights all the spaces you can enter and targets you threaten, only shows what your vision/light would allow). While I was writing this, D&D I News published a post that gave a sitrep (situation report for the uninitiated) on DDI. Apparently, they offered a pricing structure so they can charge people for reading Dragon and Dungeon magazines. Check it out if you are interested. GC is still in active development, but has a beta version out. The beta has the basics, including an interactive map, dice roller, and chat, as well as map masking, ability to draw on the map, and hit point and initiative tracker. It is going for a fairly refined interface, so it requires a video card that supports Pixel Shader 2.0 and it requires XP or Vista. The app is available for FREE. RPGtonight is browser based and you operate off their hosts (with space available for storing game info). It has a map with masking, chat window (which can be disabled if everyone is using voice), dice roller, and avatars. Its free and works with any OS that has a web browser. Viewing dale uses your graphics card to present quickly updating maps. It has an integrated chat and dice application, but beyond the fancy graphics program, doesn’t offer much. I believe you only need one license ($45 USD) but it only works on Windows. The Generic Roleplaying for Internet Players software is an IRC app published by the makers of Traveler RPG. It is basically just a layer you add onto IRC, much like mIRC if anyone is familiar with that. Finding, installing and using the software is somewhat cryptic, and it costs $35 USD. Also visit http://grip.2ya.com/ for more information. It’s an online Paranoia rules infused app. I haven’t tried it, but its free and I think its programmed in Java, which should make it cross-platform. This still in production software looks promising, it has the basics plus spell shape templates, lighting, masking, complex chat, and a combat tracker. Its Windows only and I’m not sure how much it will cost. I can remember seeing this at GenCon last year. It is still in beta and appears to have all basics but ups the ante with video chat. Simple online multiuser whiteboard with a chat box and dice. It looks to be browser based using Java and its free. Looks like a very general online card, chess, boardgame app that must be used with Skype. Bookmarked, excellent post that I’ll explore if and when I go online! I got ahead of myself while scanning the Wizard’s news post, the pricing seems to be an interim structure so they can charge for the eZines and the trial versions of the tools. My post has been edited to reflect as much. It’s starting to sound fairly affordable. I may even buy my players subscriptions if it works out to only $1 a month or so per player. Just to note, the DDI Virtual Tabletop may highlight enemies or movement area based on your movement rate, but rules interpretation is supposedly out. In order to allow homebrew content and DM prerogative, they decided that it would roll dice, and that is about all. This also means it is pretty system-independent, so if you wanted to run a GURPS game in it, you just go right ahead. @ ChattyDM, I’m glad you liked it. For sure, I would much rather play at a physical table. I have, however, thought about incorporating a digital map at the physical table, by using a projector. I don’t know if it would be a distraction or actually benefit the group, but I’d like to test it out. @ Gunslinger, Yeah I’ve done the IRC thing too, it’s not half bad especially if you can program some custom scripts. I really do hope Wizards of the Coast make this thin affordable, because their goals are frillin’ awesome. But a couple of things bug me about what Ken said about the subscription in his post and now in his email to you. When they originally unveiled their plans for DDI at last year’s GenCon, during Q&A, they were specifically asked if everyone needed a subscription to play, and we were told only the DM needed one to host the game. So now, they have re-structured their pricing to attract more people, while at the same time forcing everyone to subscribe to benefit from the table. And the way Ken is talking, it sounds like this pricing is subject to change as new tools are added. So what I really think happened is that because DDI is way behind schedule, and therefore way over budget, WotC is trying to recoup their costs by charging people piecemeal. But I don’t know, when the dust settles DDI may be the best thing that has happened in digital gaming frontier since MUDs on BBS. – Prepared for the worst, hoping for the best. There is that, but there’s also the fact that a lot of the R&D guys (who have input into all this) would be up in arms if the program started making calls for them. Also, when it was first announced, the community demanded it, in addition to the ability to make DM die rolls invisible for fudging purposes. In any case, no scaling back was involved. This is how it’s been since the announcement. Its along the same idea we were having with the projecotr, but it sounds a little more refined. Our problem was that for the projected map to work the way we wanted, it would have to project from under the table and onto some kind of surface that would catch the image. The image would also have to be mirrored so the way we saw it on the table was the same as it was on the laptop. I was thinking it would be a lot easier to do fog of war and epll effects this way (as well as digitally tracking combat). We could just project the image from above, which would make the solution far easier to implement, it just wouldn’t be as cool seeing terrain projected on top of the minis. If your friend publishes anything about that technology, definitely let me know, it would be appreciated. Yeah, they maybe saying it is for homebrew purposes, but it is more likely because they are scaling back an over budget project. If it were merely to allow homebrew stuff, they could have allowed a toggle to switch of the interpolation. They forgot (or never knew) the number one rule about project management: Under promise & over deliver. Regardless, if they deliver on what they are promising now, it should still be a pretty slick app. Great rundown! Thanks for sharing! bookmarked! first time on your site – looks great! nice design; and this post was a major time savor. THANK YOU! @ mxyzplk & jonathan Appreciate the comments, I’m more than happy to see that the community has found this useful. I think that there is one aspect of your article that is somewhat lacking: Which of these are generic platforms and which are d20/4e centric. Eg. MapTools is a very generic engine, while some of them by their names seem to be useless to non-d20 gamers. @ The Wrathchild Well, while I never categorized the software by gaming platform, what makes any of the platforms d20-centric? MapTool simply provides a method for sharing image between connected parties, right? Well, thats what most of these are. I probably approached it from a d20 player’s perspective because that’s what I am. These are all generic platforms. Most of these companies have a statement that goes something like “[insert software] is not a game, it is just a tool to play games.” Even the very d20-centric entries of d20Pro and DDI could be used to play whatever you wanted. They all can use images that can have any style mapping you can apply. I do know that some of them have built in grid lines (that are square) with a snap to grid feature, but that doesn’t mean you have to use them. ScreenMonkey has square, hex, and offset square gridlines that it can apply to maps. Fantasy Grounds has a built in grid tool, but its limited to squares, but you could always apply a hex to the image itself using whatever tools you use to make the map. Battlegrounds has built in snap to hex or square grids. Hi folks. I’m the developer of Battlegrounds: RPG Edition. I wanted to point out that my program WILL, actually, run on Linux, using either WINE or VirtualBox. The only issue I’ve heard of under WINE is that alert dialogs occasionally appear under the main program window. @The Wrathchild: Battlegrounds, MapTool, OpenRPG, and Gametable (the Java app, not WotC’s offering) are all system-independent. Fantasy Grounds and KloogeWerks have rulesets specifically tailored for a few non-d20 systems, and support scripting so that you can design your own (in practice, few people do, because of how difficult and time-consuming it is to do so). @v4grm: Regarding the DDI Game Table, just because it doesn’t enforce rules doesn’t necessarily mean it’s suitable for use with any game system. For example, a system like GURPS which requires a hexgrid and distinct figure facings might be hard to play on Game Table. @ Heruca Thanks for clarifying some things and I wish I had seen your very comprehensive list when I started out. This is a very good list. The best I have seen online. I will have to find a place to link to it from my website. Its a bit more than a virtual desktop as well. Allows you to build your own character generators for any game system. Post Necromancy! In all seriousness, just wanted to say thanks for this article. I have recently considered getting into virtual tabletop gaming and this has been a great starting point/reference. @The Last Rogue: Glad the list was helpful! I just wanted to stop by and thank you for taking the time to review these virtual RPG sites. I’m new to the virtual side of things and think it’s a great idea. Is there any that can actually play music that you have on your computer for all the players to hear as well. I’m a big fan of mood music and that would totally rock. Battlegrounds lets you trigger music files on remote clients, but you first need to send your players a media bundle containing your music files. This isn’t required for short samples or sound effects (which are transferred on-demand), but music files tend to be very large since they run for several minutes. The good thing is that since the players already have the music files, when you issue the command to play a song, it starts playing for everyone simultaneously. Another nice aspect is that the music files are copy-protected, so you aren’t unwittingly participating in music piracy.